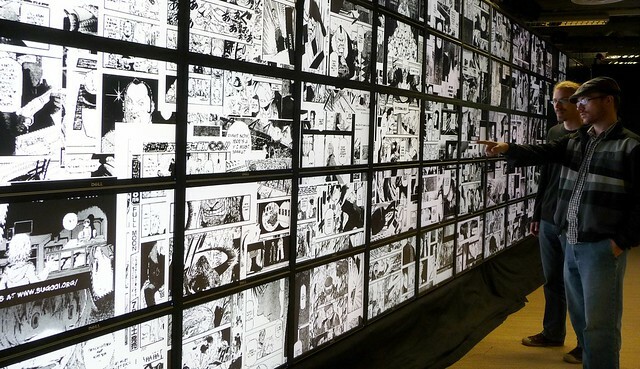 Researchers from Software Studies Initiative exploring one million manga pages dataset on HIPerSpace supervisualization system at Calit2. All readings for this class will be available online at no charge. The class will use free publicly available software as well as software tools developed by Software Studies Initiative. Cultural Analytics is the use of computational methods for the analysis of patterns in visual and interactive media. Our core methodology combines digital image analysis and next generation visualization technologies being developed at Calit2 and UCSD. We also developed an alternative methodology to explore large visual data sets directly, without any quantitative analysis. In the first part of the class the students learn cultural analytics techniques and software tools. In the second part all students work collaboratively on a project to create dynamic animated visualizations of large visual data sets. The data may include visual art, graphic design, photography, fashion/street styles, feature films, animation, motion graphics, use-generated video, gameplay video recordings, web design, product design, maps, sound, and texts. We will also have access to state of the art supervisualization system at Calit2 (HIPerSpace) to explore large data sets. Patricia Cohen. In 500 Billion Words, New Window on Culture. From New York Times Humanities 2.0 series. Manovich, Lev. What is Visualization? 2010. Visit all projects referred to in the article. 1. Install ImageJ on your computer. 2. Work through imageJ basics tutorial using image(s) of your choice. 3. Read Image J documentation: Basic Concepts, Macro Language. 1.Wikipedia article on Image Processing (also look at all links under "Typical Operations"). 1. Fernanda B. Viégas and Martin Wattenberg: Artistic Data Visualization. 2006. Visit the websites for all projects described in the article. Each group should prepare a proposal for the final project. Final project should present analysis and visualizations of interesting patterns in a relatively large cultural data set. You can use any data sets (still images, video, text, 3D, geo, etc.). The only requirement is that you have to analyze the actual content of the data and not only metadata. Practically, this means that you have to use computational techniques to calculate stats and/or extract some features from your data. Of course, you can also use any metadata available and/or add metadata of your own via manual annotation. Visualizations: you can use any software and/or write your own; the final visualizations have to be both meaningful and visually striking. - relevance: why this project would be interesting to others? The proposal also need to include the small pilot study (download a small sample of your data, analyze and visualize it to see if your hypotheses hold up; if you dont get interesting results, you need to revise your idea or choose a different data set). The proposal can be created in any format (Powerpoint, web page, blog post, etc) as long as it contains the required text parts and the visuals for the pilot study. Note that if you dont have a solid proposal and a convincing pilot study, you would have to redo it.